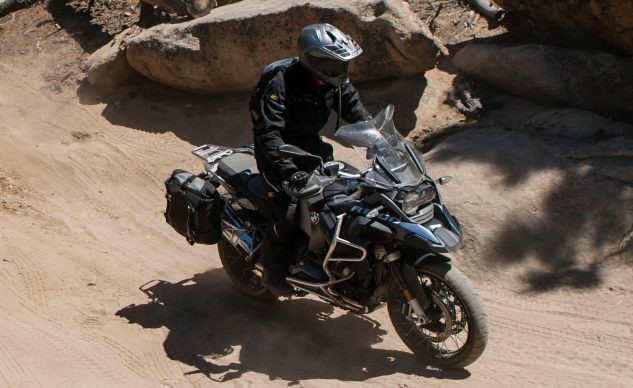 Adventure motorcycle helmets meld the features of on-road and off-road lids to provide adventure riders with a level of versatility that mirrors that of their machines. Manufacturers of all sorts have jumped into the ADV helmet market to give us riders a smorgasbord of options to choose from. We’ve put together the list below to give adv-curious riders a one-stop article to check out the full range. From budget-minded to expensive feature-packed lids, there’s something here for everyone. The AGV AX-9 recently replaced the AX-8 which had been a great adventure helmet for AGV since 2011. With this new model, AGV has redesigned the ventilation system on the chinbar giving users venting which can be closed from the front or back as well as being able to completely remove the front closure system to allow for a more dirtbike-esque open chin vent. As before, there is still an open-cell foam type filter in the chin bar vent. The AX-9 is made from a tri-composite blend of carbon, Kevlar, and fiberglass as before and can also be had in full carbon for $150 dollars extra. One visibly noticeable difference between the newcomer and the outgoing model is the peak. The peak on the AX-9 is, to put it lightly, large. Larger than the AX-8 by a decent margin. AGV says this allows the peak to better do its job of keeping the sun out of your eyes and the shape and design of the new piece is more aerodynamic. The AX-9 also comes with a pinlock-ready shield and, unlike the previous model, had dedicated cutouts for a communication system to be installed. The interior liner material has also received an upgrade with Shalimar materials among others to give a more premium and comfortable interface with your skin. The fit of the helmet itself has also been refined to fall more in line with the standard intermediate oval head shape which is most prevalent in the U.S. whereas the previous version was a bit tighter in the crown. The AX-9 is DOT and ECE rated. The only downsides would be that AX-9 is slightly heavier than its predecessor, even still the helmet is relatively light, and the AX-9 is $100 more expensive than the previous version’s original retail price. Graphics can be had for an additional $50 and again, a full carbon version is available for $649.95. The Arai XD-4 is a staple in the adventure motorcycling community. It has been around for quite some time and protected the likes of Ewan and Charlie during their around the world explorations as well as countless other adventurers. The XD-4 has an intermediate oval head shape and a liner that allows the user to peel away 5mm layers of foam in specific areas to help adjust the fit. Ventilation is managed by two brow vents in the shield which can be opened or closed, two top vents, an adjustable chin vent, two chin bar vents, and a total of four exhaust vents. All of the vents aside from the lower exhaust vents can be closed. The shape of the peak and helmet itself has been aerodynamically designed to reduce buffeting and increase comfort when riding at speed. The Arai XD-4 is SNELL and DOT rated. Other color variations can be had, most of which are priced at $739.95. 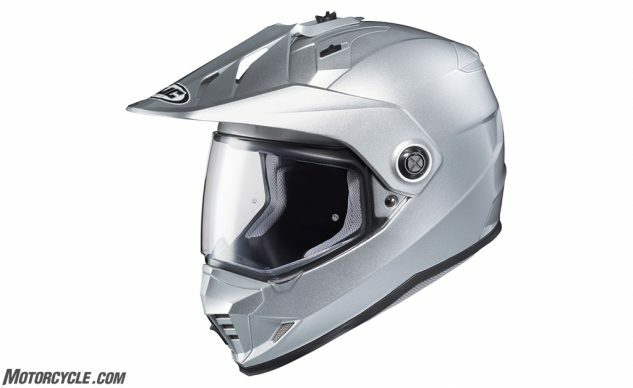 The Bell MX-9 Adventure MIPS helmet is based on the company’s MX-9 motocross helmet with added features such as a sealing face shield for adventure riders. The helmet and shield are designed to work with goggles with the shield in the up position. The polycarbonate shell comes in three sizes keeping extra heft to a minimum. This version of the helmet is equipped with MIPS, the Multi-directional Impact Protection System which is designed to more efficiently disperse rotational impact energy. The MX-9 Adventure uses Bell’s Velocity-flow ventilation system to keep riders cool and the moisture-wicking liner is removable for washing. 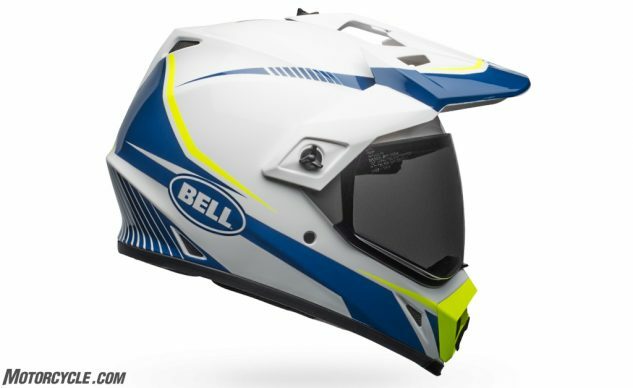 The Bell MX-9 Adventure MIPS is DOT and ECE rated. Graphics range in price from $219.95 to $239.95. HJC offers a large lineup of products from budget-friendly to premium. The DS-X1 is the company’s entry-level adventure helmet which can easily be converted for street or dirt biased use. The peak is easily removable with a Phillips head screw for pounding out the miles at highway speed and the shield can be removed quickly to use goggles for off-road work. The DS-X1 uses a polycarbonate shell and comes with a pinlock-ready shield. Closable chin vents and top vents allow for air to channel its way through to the exhaust ports on the back of the helmet. The HJC DS-X1 is DOT rated. Graphic options range in price from $189.99 to $194.99. 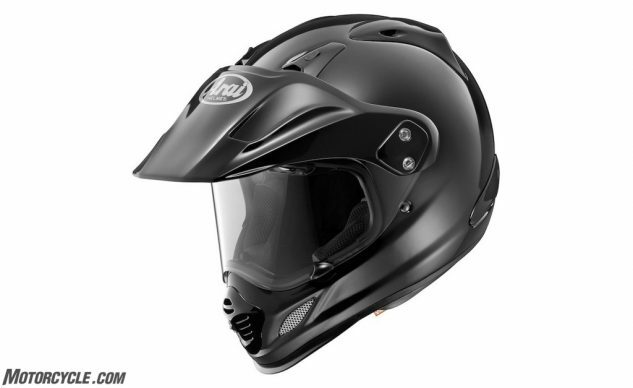 The new KLIM Krios Pro is the newest offering in the KLIM helmet lineup. This new helmet packs a ton of tech and versatility into its hand laid carbon fiber shell. The use of carbon fiber isn’t the only weight saving measure though. After seeing Koroyd material used in the KLIM F5, the use of this new material in the Krios Pro is the first time Koroyd has been used in a street motorcycle helmet. Koroyd is a lightweight composition of welded polymer tubes and claims to absorb up to 48% more energy than traditional EPS during an impact. Not to mention it ventilates quite well, too. The features don’t stop there. The Krios Pro features fully adjustable chin and forehead vents as well as KLIM’s KLIMATEK removable antimicrobial moisture-wicking liner. Refined aerodynamics from the previous Krios model is said to provide a quieter ride and better stability at speed. A Pinlock-ready shield and Transitions shield is included with the Krios Pro. The Fidlock magnetic closure found on the Krios Pro is a feature we raved about in our F5 helmet review. 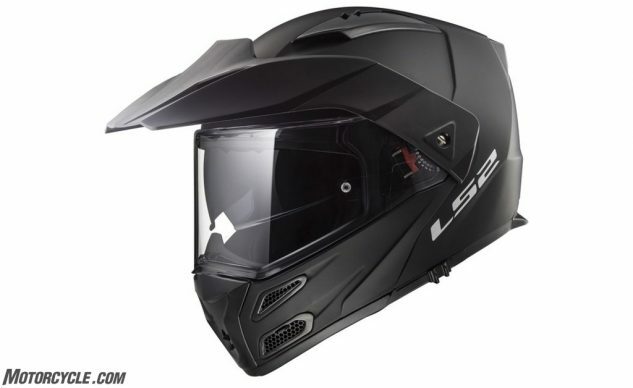 The helmet is easily converted into four different riding styles: adventure, which is how the helmet is set up out of the box, dual-sport with the use of goggles with the shield still attached, off-road with goggles and the shield removed, and street with the peak removed. The Krios Pro is also compatible with Sena’s 10U unit or other comm systems. The KLIM Krios Pro is DOT and ECE rated. The LS2 Metro V3 packs ADV features into a modular helmet. The Metro V3 sports an intermediate oval head shape and is made in three polycarbonate shell sizes to keep bulk to a minimum. For versatility, the visor and peak can be removed to let users configure the helmet as their adventure unfolds. The Metro V3 offers plenty of ventilation through the chin bar which can be closed should cooler temps arise. An internal sun visor is also included and the V3 uses a ratcheting-type closure on the chin strap. The liner is fully removable and features dedicated speaker pockets for adding a comm system. The Metro V3’s shield features a fog-resistant coating, but is not set up to use a Pinlock. The LS2 Metro V3 is DOT rated and can be had with graphics starting at $239.98. 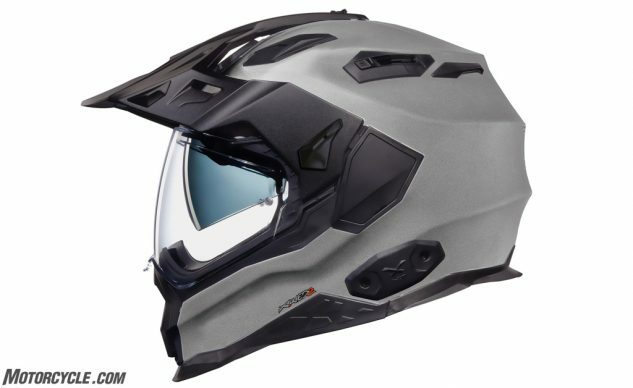 The Nexx X-Wild Enduro helmet is designed to meld the advantages of touring and off-road lids. 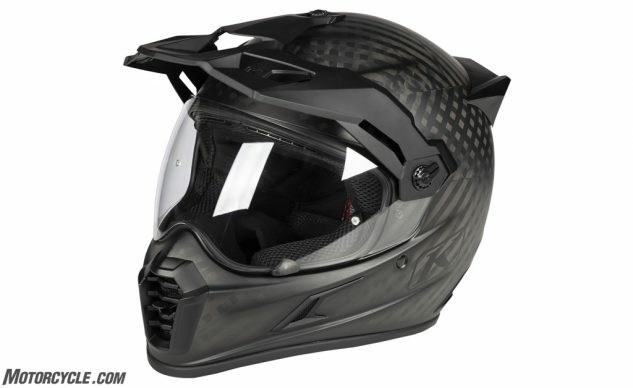 The X-Wild uses three shell sizes made up of X-Matrix material which is a tri-blend of fiberglass, aramid, and carbon fiber to keep the helmet lightweight. In the box, users have the option of leaving the adjustable street chinbar vent in place or replacing it with the provided off-road vent which allows for more airflow. There is also a peak extender should you want to elongate the helmet’s peak. Revised closable vents across the top provide more airflow when compared to the outgoing model to keep riders cool in technical situations. The internal padding can also be tweaked with the provided extra foam which gives users the option to add padding where they see fit. The helmet is set up to use the Nexx X-Com communication system or whichever comm unit you prefer. The shield is Pinlock-ready although the Pinlock itself is sold separately and the helmet features an internal sun visor. The Nexx X-Wild Enduro is DOT rated and available in graphics starting at $529.95. Schuberth’s E1 is based on its highly successful C3 Pro modular helmet. Another modular, you say!? Yes, and this isn’t the last on this list. The C3 Pro modular helmet from Schuberth is touted as one of the quietest helmets on the market and we’re told this carries over into the E1. The chin bar has received a new vent to allow for more airflow and a three-position adjustable peak to protect from sun and roost. The peak or shield can be removed for the rider’s preferred setup. The outer shell is offered in only two shell sizes for a seven size run between XS-3XL. The COOLMAX and Thermacool liner materials work together to keep the rider comfortable and are fully removable for washing. 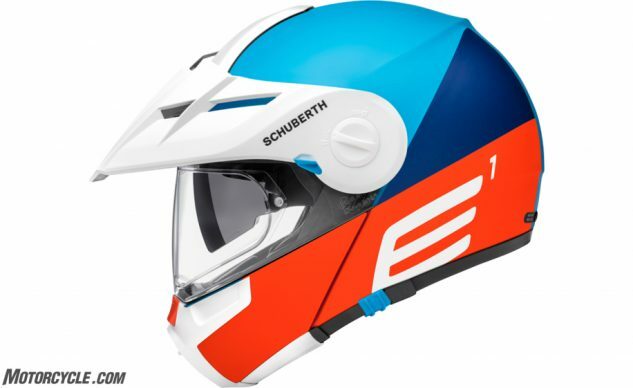 The E1 uses Schuberth’s Anti-Roll-Off System which is incorporated into every Schuberth helmet to ensure when the ratcheting chin strap is adjusted correctly, that the helmet will not roll off the rider’s head. The E1 can be used with the Schuberth SRC system or other communication systems. The Pinlock ready shield and included Pinlock keep the shield fog-free no matter the weather outside. The Schuberth E1 is DOT rated and available in graphics starting at $849.00. Check out John Burn’s full review of the Schuberth E1 here. 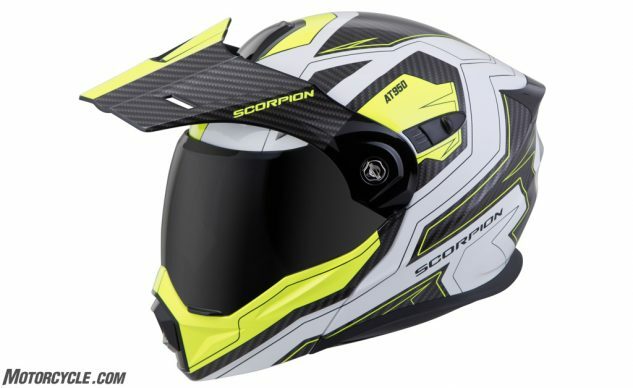 The Scorpion EXO-AT950 gives riders the versatility of an adventure helmet with the convenience of a modular. This polycarbonate lid is offered in three shell sizes for its XS-3XL size run. Riders can choose to remove the peak or shield to configure the helmet to their adventure. The shield features an anti-fog coating and an internal sun visor is also included. A dual configurable chin vent gives ventilation options while the top vent and exhaust vents route air in and out of the helmet. The KwikWick liner is antimicrobial and is designed to keep the rider comfortable in cold and hot weather. The AT950 has dedicated speaker cutouts to allow for comfortable installation of your preferred comm system. The Scorpion EXO-AT950 is DOT rated and available in graphics starting at $289.95. Check out Troy Siahaan’s full review here. Shoei helmets carry their own standard. Loved by those around the world, the first iteration of the Hornet enjoyed success as Shoei’s first adventure helmet and the Hornet X2 follows in its footsteps. The Hornet X2 uses four shell sizes for its XS-2XL size range. The new peak has been aerodynamically designed to provide less buffeting and distortion at speed. The visor and shield can be removed to allow users to fine-tune their configuration and the shield can be removed without removing the peak to make things easier. The liner is removable and washable and features an emergency quick-release system should the rider have an accident and be in need of help. Tons of ventilation can be adjusted to fine-tune the airflow through the helmet and a removable breath guard and chin curtain are included. The face shield is Pinlock-ready and the Hornet X2 comes with the Pinlock insert. 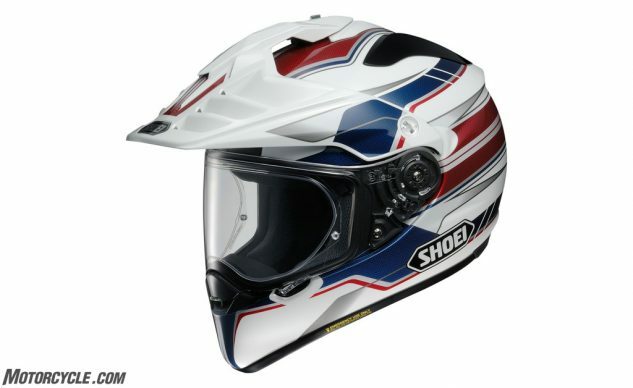 The Shoei Hornet 2 is DOT and SNELL 2015 rated. Graphic options can be had starting at $715.99. The helmet is so loved around MO that both Tom Roderick and Evans Brasfield have reviewed the Hornet X2.